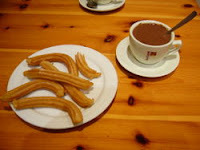 Recently my daughter and I decided to try a typical Spanish treat- chocolat and churros. We visited a little churrería on the main street of Guardamar which was clearly very popular with all the locals. If you have a sweet tooth then this is a perfect breakfast or snack. The chocolat is a cup of hot melted dark chocolate, served with churros- a sweet fried pastry. It is traditional to dip the churros into the chocolat, and very delicious! Some people say that churros are named after the churro breed of sheep, as the ridged strands are remeniscent of the sheeps horns. My daughter is a total chocoholic and says everyone should try it! Churros are made (somehow) of potatoes. Churros are maid of wheat flour, sugar, milk... and fried in olive oil.